At first glance, one could mistake this scenario as one describing Mali: poor governance, lack of attention and responsiveness to ethnic groups or regions - often tribal based - which then leads to bitterness, lack of connection to the concept of a nation, ending in a coup. Islam providing a convenient unifying vision, at least unifying enough for the rebels. But no, the country, this time, is the Central African Republic (the CAR). The previous president, Mr. Bozize, has been run off by the new coup leader, Mr. Djotodia. CAR is an impoverished landlocked country in Central Africa that indeed has a fault line running through it, with Bantu tribes in the more fertile south, and nomadic, often Muslim-oriented tribes in the more-arid north. But unlike Mali, the underlying reasons behind the latest coup are primarily a reversion to the old days where poor governance, lack of institutional strength, regional neglects leave rulers vulnerable, and in this case some vague meddling by neighbors, both near and far. And, one might say this coup also represents yet another ripple from Libya's 2011 war that flooded the region with arms Governments in neighboring countries and ethnic groups that transcend so many country boundaries, are all jockeying for their new places in the upended order of power centers. From Hutchinson Encyclopaedia country facts - Capital: Bangui; Language: French (official), Sangho (national), Arabic, Hunsa, Swahili; Religion: Protestant 25%, Roman Catholic 25%, animist 24%, Muslim 15%; Physical features: landlocked flat plateau, with rivers flowing north and south, and hills in northeast and southwest; dry in north; Population around 4 million; Life expectancy: 39 (men), 40 (women). Central African Republic's northern lands are drier, typical of the Sahel gradation that leads to the deserts of the Sahara. The land supports more cattle, grazing, and a pastoral lifestyle. 16th century Part of the Gaoga Empire. 16th-18th centuries: Population reduced greatly by slave raids both by coastal traders and Arab empires in Sudan and Chad. 1889-1903 The French established control over the area, quelling insurrections; a French colony known as Ubangi-Shari was formed and partitioned among commercial concessionaries. 1920-30 Series of rebellions against forced labour on coffee and cotton plantations savagely repressed by the French. 1958 Achieved self-government within French Equatorial Africa. 1966 Jean-Bedel Bokassa came to power in a coup in 1966, and(from Wikipedia)"then began a reign of terror, taking all important government posts for himself. He personally supervised judicial beatings and introduced a rule that thieves would have an ear cut off for the first two offenses and a hand for the third. In 1977, in emulation of his hero Napoleon, he crowned himself emperor of the Central African Empire in a ceremony costing $20 million, practically bankrupting the country. His diamond-encrusted crown alone cost $5 million. In 1979 he had hundreds of schoolchildren arrested for refusing to wear uniforms made in a factory he owned, and personally supervised the massacre of 100 of the schoolchildren by his Imperial Guard. In September, 1979, French paratroopers finally deposed him ..."
Emperor Bokassa holding court - another parody of enlightened self government so common among African leaders ... Comical except for the impoverishment of his people, setting them back generations. 2004 New constitution approved in referendum. 2006 French military forces supported his government offensive against rebel positions in northeast of country. Which brings us up to the coup that occurred in late March, 2013. From the New York Times, "The leader of the coup in the Central African Republic, Michel Djotodia, solidified his hold on the government on Monday after announcing that he would serve as both president and defense minister and that fellow rebels would fill other top posts. Mr. Djotodia, who rose to prominence as a rebel leader in 2006, had already served as defense minister in an ill-fated unity government formed in January. But the rebels accused President François Bozizé of failing to deliver on promises related to the January accord and ousted him last month." 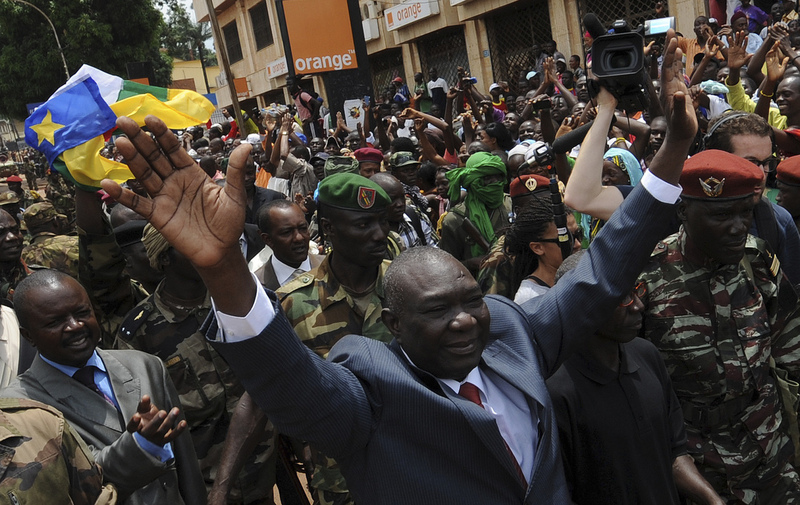 Michel Djotodia, the rebel leader who declared himself president of the Central African Republic, arrives on Republic Plaza in Bangui, the capital city, on March 30. The same Michel Djotodia in war costume, shedding the western style suit worn during his inaugural walk through the capital Bangui. While there are some similarities between Mali's Toureg people and the Seleka coalition if ethnic groups that Djotodia leads(similar in that they perceive they have been neglected or frozen out of national participation) there seems to be more involvement/interference from neighboring Chad in this case. From a UK Daily Mail report, "The people of this riverside capital [Bangui] are not strangers to violence. Apart from an almost constantly simmering rebellion usually in more than one part of the country at the same time, Bangui residents have come to expect a military coup virtually every 10 years. Ten years ago Bozizé was the instigator, this year he was the target. This time around, [however] it's less clear who is in charge. There are far too many uniformed Chadians racing through the streets and manning impromptu roadblocks for this to feel like an internal conflict." From the German news agency, Deutsche Welle, we read the question, "What possible motives could Chad have for backing a coup in the Central African Republic? Chad has always been very involved in the politics of the Central African Republic. In 2003 when President Bozize organized a coup, he did it from Chad. So it's quite ironic that now he's accusing Chad of being behind his fall. Chad has a lot of economic interests in CAR, there are a lot of traders moving between the two countries, the economies of the two are very much linked. Last year President Deby went to Bangui and tried to reconcile the opposition and President Bozize. He didn't succeed but this shows how influential and important N'Djamena is in the politics of the Central African Republic." * A leader who came to power 10 years ago, was deposed in another coup a few days ago. * Chad seems involved to some degree. * Ethnic and religious distinctions are at play. * Libyan arms and re-aligning coalitions are also still rippling through the Sahel. * South Africa - whom former President Bozize had cultivated as a new backer for his regime - lost over a dozen soldiers in fighting while they tried and failed to protect his government in Bangui. SA, though, has since maintained virtual silence in this latest powerplay. * France, historically quick to intervene in its many former colonies - as it did in Mali earlier this year - has not moved significantly in this coup other than to protect its French citizens in the country. * Looting and poor discipline among the victorious rebels are not setting the stage for a positive outcome. Earn faucet satoshis from CLAIM BTC. 21 to 57 satoshis per 20 mins.